Not only performs well...it looks great too! Available only for the Laboratory Market! The Pre Vacuum Autoclave not only performs well, it looks good too. It reflects the trend toward modern, clean aesthetics. With a new mint green livery, a color coordinated control panel, which is both east to understand and operate , plus new state-of-the-art electronic control systems improving product reliability and cycle times. Warranty: The one-piece stainless steel chamber had a full 10 year guarantee while the boiler carries a lifetime guarantee. It is built to last . It is constructed from the highest quality material with first class finishing, all rigorously tested before leaving the factory. The door mechanism has an International Patent (No PCT/GB97/02586).. you can open the door with the strength of your smallest finger. It is as easy as that on a microwave oven. It is very safe too. It is impossible to open the door while the cycle is in process. This unit is designed with the operator in mind, while making sure that at the end of the cycle, whatever is in the chamber is 100% sterilized . The chamber heating system is unique. The water comes to a boil very quickly. This is because of the small boiler which is located at the bottom of the chamber. Once the water comes to a boil, pure steam is injected into the main chamber. What this means is that you will never have to spend any money to purchase chamber cleaner, nor will your staff spend time cleaning the. The real benefit is that since the chamber is never being heated by a heater, it never gets dirty, nor will it burn out like other sterilizer chambers do. 1. The Pre Vacuum uses a powerful vacuum pump to ensure the removal of all the air from within the chamber prior to sterilization. 2. In the absence of air, steam is able to penetrate to all instrument surface, including inside the narrow lumens of hollow instruments such as complete dental handpieces and scopes. 3. The use of vacuum autoclave is also imperative if instrument pouches or bags are to be used. 4. On completion of the selected sterilizing cycle, the Pr Vacuum automatic, pulse, post-vacuum drying phase, ensures instruments are perfectly dry. 5. The post vacuum drying of the instruments helps keep valuable instruments in good condition and prolong their life. 1. As pressurized steam enters the chamber, air is forced out, allowing the steam to come into contact with all instrument surfaces, destroying harmful bacteria and spores. 2. When an extremely fast turnaround of instruments is required, selecting the standard non-vacuum cycle, without drying, can offer a total cycle of 13 minutes. 3. Non-vacuum autoclaves are particularly suitable for applications where predominantly solid instruments are used and a fast turnaround is crucial. and non-porous loads (excluding lumened instruments, and dental handpieces). The optional printer can be purchased with the sterilizer, or could be added by the end user later. The printer provides the user with a permanent record of each completed sterilizing cycle. 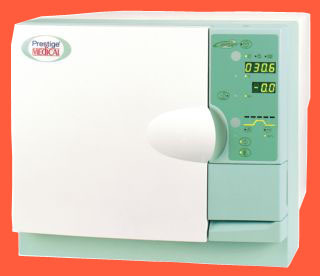 Information includes the model & serial number, the date, time and cycle number, plus the time, temperature and pressure of the sterilizing cycle.